“This year has been the best of my life,” the 21-year-old Cuban native said at the event in Bilbao, northern Spain. Cabello had opened the show hosted by American actress and singer Hailee Steinfeld with a rendition of her Latin-influenced “Havana”. She is fresh from winning prestigious prizes at the MTV Video Music Awards in August – artist of the year and video of the year — after her album “Camila” reached the top of US charts in January. The audio version of “Havana”, which features rapper Young Thug, has had more than 1.3 billion hits on YouTube. The former member of the band Fifth Harmony was also named best pop artist at last year’s MTV Europe Music Awards. 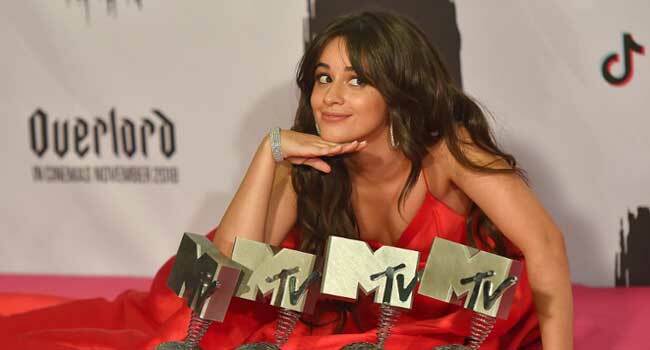 Cabello had six nominations, followed by five each for singer Ariana Grande and rapper Post Malone and Canadian artist Drake and Britain’s Dua Lipa with four. With two awards – for best hip-hop artist and best look – US rapper Nicki Minaj held her own, making two appearances on stage, with French DJ David Guetta and US singer Jason Derulo. US veteran Janet Jackson was crowned a “global icon”, a title previously awarded to U2, Queen, Whitney Houston and Eminem.